I’ve created a cool Blackout Journal that’s ideal for doodling, list-making, and creative journaling. It’s fun to write on with gel pens, white pencils, or metallic Sharpies. This journal isn’t printable (That would take too much ink). You can buy it on Amazon.com in either lined or unlined form. Blackout Journal and how pens glide over the smooth pages. It makes for an almost glow-in-the-dark effect. 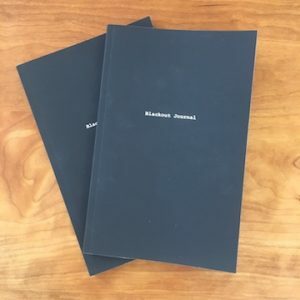 Each Blackout Journal has 120 pages. The books are a compact 5.5” by 8.5” so they’re super portable, plus the journals are neatly bound but lie flat for easy writing. The journals are available via Amazon, and ship right away (free for Amazon Prime members) Each journal costs $7.99. 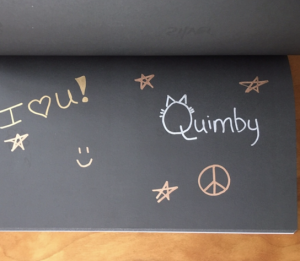 I’m having a blast with my Blackout Journal, but they’re fun for kids, too. Blackout Journals make a great gift, especially if you add a set of gel pens or Sharpies.